Cork City manager, John Caulfield expects Derry City to take points of the top sides in the league this season. CORK City manager, John Caulfield expects Derry City to cause lots of problems for teams battling for the league title this season on the evidence of last Friday night’s match at Brandywell. 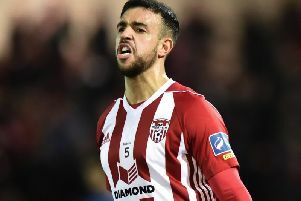 Caulfield felt Derry City ‘won the battle’ on Friday night and were full deserving of the three points having adapted to the ‘bumpy’ condition of the Brandywell pitch best. Whether or not they will be in the top four it’s hard to know yet but certainly you would expect them to win a lot of games and cause a lot of problems. “It’s difficult for Kenny (Shiels) coming in as a new manager, getting to know the league,” said Caulfield. “Obviously he had a welcome last week in Harps which was always going to be difficult. “His team looks to have a lot of pace, a lot of energy and they try to play. So as he works with them over the next number of months you would expect them to get much better. “Whether or not they will be in the top four it’s hard to know yet but certainly you would expect them to win a lot of games and cause a lot of problems. “We’re disappointed with the result but fair play to Derry, they played very well and won the battle. They got a great goal from Ronan Curtis which came from a mistake. “It was a night where a mistake was going to decide it. It’s a great result for Derry to bounce back after last week but we’re disappointed because I don’t think we played as well as we can. Conditions were difficult but Derry deserved the win. “We didn’t create enough and a lot of the boys were below par. It was a bad night for us. Some nights like this you just have to take them on the chin and get ready for the next one. “Derry contained us very well. Conditions are always very difficult and the pitch was obviously wasn’t good.